My wife and I watched Nebraska's volleyball team lose to a very good Penn State team last night. Penn State hadn't dropped a set all year but Nebraska took the 3rd and 4th set from them and had them down 10-8 in the fifth. Then Penn State rattled off a bunch of points in a row and just like that, Nebraska was toast. As Nebraska was winning its two sets, my wife was jumping around the room, living and dying with every point. At one point she looked over at me and said, "How can you just sit there?" How can I just sit there? I was practicing. Let me explain...I tell my soccer teams that even off the field they should practice handling pressure situations. They should put themselves in a pressure-packed situation on purpose and rehearse being able to deal with the high anxiety of a big event. That is what I was attempting to do. Believe me, my heart was beating fast as Nebraska was coming back, but I was attempting to remain calm and trying to think what I would say to the Nebrasksa team at the next time out. Ya...I know that is kinda out there..but that is what I did. In addition to being the coach of the awesomely cool CSM Flames, I also am a fan of the Green Bay Packers professional football team. I had high hopes this year for the Pack because, last year--they were within one game of the Super Bowl. I had hoped this year they would take the next step. Not happening. With 3 games left in the season, the Packers are 5-8 and probably won't make the playoffs. They still have a slight chance (there is alway hope) but it is not a great chance. What went wrong? Defense, defense, defense. The defensive side of the team cannot stop anybody--a team that is 9-3 or a team that is 5-7. Doesn't matter, the Pack doesn't discriminate against who it can't stop. Injuries have effected their play but that is not the whole story. The coaches say it is a matter of execution. The players are not executing the game plan. What happens? In pressure situations, sometimes players brains don't work as well as they do in practice situations. Two things will help, repetitions during a pressure situation as well as training your mind to deal with pressure. I tell our team that you can do 2 things with pressure, you can feel it or you can apply it. (I got that from Jon Gruden, Tampa Bay Bucs football coach.) I take it a step further and tell the team if you are "feeling" pressure, then you should "apply" pressure to the other team and then you won't feel it so much. The lack of success the Packers are experiencing just goes to show you how important defense is to a team. When people say that defense wins championships--they know what they are talking about it. 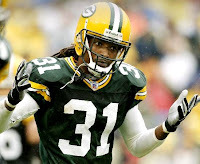 I just wish the Green Bay Packers could play defense this year. When I coach, I really try to get the players to make a total commitment to defense. That is one road to success. What else do I love??? I love soccer and just can't get enough of it. I give thanks for Fox Soccer Channel which gives me the power to watch Manchester United on the Premier League review show on Sunday nights. Can you tell that I already miss my CSM soccer team and the season has barely been over for 3 weeks? I want to thank the team for an enjoyable season. The next thing on the soccer team's agenda is to help out at CSM basketball games, taking money at the gate, selling concessions, taping the game, etc. One of our soccer players is also a basketball player (Kira Cross.) The manager of the b-ball team is also a soccer player--our own Mollie Jones (MoJo.) We are working the games on the 28th and the 1st. Come and support the b-ball team if you can and say "Hi" to both basketball and soccer players! The team has a break from soccer and conditioning until mid January, when we start our Xplosive Edge training. There won't be much news in the next few months unless we have recruits sign. I am hot on the recruiting trail now and hope to sign a few more to bolster our talented team. Wish me luck! One of our mottos for this year was "start fast, finish strong." We gave a good attempt to do that this season and to do the same in every game. Sometimes we did and sometimes we did not. Playing Park at Park for the second time in a week in our conference semi-final did not finish the way we wanted and we fell 1-3. We definately started fast in the second half but we did not finish strong. Park opened up the scoring in the first half. A ball was sent into the box which we unfortunately headed almost straight up in the air and Park pounced on it. The first half ended with us down 0-1. Second half we came out strong and were able to tie when Daniela Padilla dribbled half the length of the field and scored, beating 4 players in the process. I distinctly recall telling Daniela at halftime that she could dribble around their whole team if she wanted, and so she did. Park fought back bravely and we were able to make some key blocks and saves. Jackie Swanger got her fingertips to a great shot and knocked the ball wide enough to hit the post and rebound to the feet of Padilla. Daniela cleared it but it was intercepted and put right back into the box to an unmarked Park player who buried it. That goal shattered our hopes and we were unable to reply. I told the players after the game that it has been such an honor and privilege for me to coach them this year. I know there were some frustrating times but there were also some great moments and I will remember those forever. One of the best things about this team was how well they got along on and off the field. They truly were family. I wish our record would have reflected our effort and our togetherness but it didn't. I thought we were a better team that what was reflected in our final record (7-9-1.) I look forward to next year, though. Our team was very young this season and took some time to figure out how hard and how smart they have to play. Next year--we don't have to go through those kinds of growing pains and there is no doubt we will achieve excellence. The future looks bright--the only one whose eligibility is up is senior player Daniela Padilla. We will all miss "Dee" for sure. She had a great career at CSM and we wish her nothing but the best as she finishes up her nursing degree. Watch out for the Flames next year! I am very pleased to announce the signing of our first recruit for the 2009 soccer season, Raeleigh Withey. Raeleigh is a keeper that has had great success with her club team, ODP team as well as her Rocky Mountain High School soccer team in Colorado. Raeleigh's high school team made it all the way to the 5A state semi-final in May. Raeleigh had a great visit with us in August. During her visit, she was able to practice with us, making a memorable save where she had to change direction in mid-air. She was even able to play forward on the field for awhile (Raeleigh is very fast!) The rest of her trip she attended a team dinner with us and spent the night in the dorms. I personally like Raeleigh's commitment to excellence and her outstanding effort and hustle. She will bring a great attitude and work ethic to CSM and will definately contribute to the success of the Flames. Welcome to the Flames Family! A Few Steps Back Before the Next Step Forward. We have been taking steps forward recently but took a few steps back today. We were unable to deal effectively with Park's attack and gave up fairly easy goals to fall to the Pirates 0-3. Started strong but then failed to mark central runs sufficiently on a cross and Park's Chapman had a free shot and she made no mistake. Ironically, their goal came minutes after our best opportunity where we chipped the ball over the defense to King who headed it over the keeper but hit the crossbar. Their other goals again capitalized on some of our silly mistakes. We have plenty of time to clean those up this week and we know what we need to do. Part one of the CSM-Park battle went to Park. We get to see them again this Friday, same place, same time (Park's Julien Field, noon) for the MCAC Conference Championship Tournament. We are looking forward to seeing them again. The next weekend (Nov. 7-8) is the MCAC Conference Tournament and we are playing Park in the first round of the tourney at Park. It will be deja vu all over again since we will be playing them two weekends in a row (almost like the movies Halloween I and the sequel, Halloween II.) Deja vu, of course is the feeling that you have been somewhere before (maybe we should call it deja boo? :) The winner of the conference tourney moves on to the National Tournament. Make no bones about it, playing Park two weekends in a row will be a monster challenge for us. But as I told the players, if we can go up to South Dakota and play a D-I team in winds howling like a werewolf at 50 miles an hour and beat them--we can do anything. Nothing is scary anymore, we have banished all our ghosts back to the shadows of the graveyard. I believe next 2 weekends will be all treats for us and no tricks. A great weekend for the College of Saint Mary Flames. We defeated conference rival York 2-0 and the University of South Dakota 1-0. The York game was moved to Ralston High School's artificial surface after our game field endured a weeks worth of rain. Versus York, we played a complete game with both goals coming in the second half within minutes of each other. The first goal was created and finished by Daniela "D" Padilla and the second was finished by Melissa King from a cross by Daniela. That was Daniela's last regular season home game for the Flames--she is our lone senior. Molly "Mojo" Jones recorded her first solo collegiate shut out. On Sunday we drove through gale force winds on the way to Vermillion, South Dakota to play the NCAA division one 'Yotes on their field in front of the Dakota Dome (see pic.) The trainer at USD told me that the winds were howling at 40 miles per hour with gusts up to 50 mph. In the locker room inside the Dakota Dome before the game I addressed their concerns about the wind. I basically said, yes--it is ridiculous that we have to play in these conditions but we don't have any control over the weather. However, we do have control over how we react to the weather. I told them not to freak out about it but play smart and remember there are advantages and disadvantages to having the wind at your back and in your face. They must have really taken it to heart cuz we went out there and won 1-0! The local paper wrote about the game and even quoted me in the story. We didn't make the silly mistakes that we have made too often this season. We capitalized on our opportunities and remained mentally strong when experiencing adversity. Jessica Alexander had a great goal--she got the ball up into the wind and it was very difficult for the keeper to deal with. That is great for Jessica--she had been shooting some awesome shots in practice and it was good to see her get one on Sunday. Against the wind in the second half, we came out the first 5 minutes and played a little keep away with the 'Yotes in their half. I think they weren't expecting that and they became a bit disheartened. USD was able to get off 23 shots for the game, but nothing that Jackie Swanger and the defense couldn't handle. Jackie recorded her first solo collegiate shut out also. We beat a good opponent at their place under extreme conditions and we did it not by being lucky, but by playing good, solid soccer. I am very proud. All we need to do is build on it, step by step. We made some progress today but didn't do quite enough on a 0-1 loss to cross-town rival the Bellevue University Bruins. Bellevue scored about 20 minutes in after a couple mistakes by the team left the ball sitting in the box and the Bruins were able to get a good shot off and put the ball in the back of the net. We had a bit of a lull the last 10 minutes of the first half and were back on our heals for awhile. We had 3 shots to Bellevue's 10 during the first half. The second half we came out strong and had much more possession. The team got a definate lift from the sideline's enthusiasm and spirit. We fed off of that for a lot of the second half. We increased our shot total to 11 and let Bellevue have 8. Our problem was when we got into the offensive third we weren't able to get that final killer pass or cross to get a good opportunity at the goal. We did have a free kick just outside the box but the kick went straight into the wall. Unable to capitalize on our possession, we failed to tie and the game ended 0-1. We have been doing well in practice and just need to take that energy and enthusiasm, skill and smarts to the game. We played better and at times, out played Bellevue, but didn't quite do enough. I thought our team played very well on the defensive side of the ball for the most part and really didn't give BU any clear cut chances in the second half. I believe we are a team about to catch fire. We had some sparks today. I saw improvement. We just need to stay positive, persevere and good things will happen. I believe that eventually our team will find its groove and shine. It has been quite a climb to get there, but we are almost there. Count on it. Tomorrow we play Bellevue University at 1 PM at our place. It is an important game for us (although they all are important, aren't they?) We have been a team that is inconsistent and that has hurt us at times and other times it hasn't. The only way to approach inconsistency is to keep working hard and persevere. We have had a great week of practice and I am looking forward to the challenge on Saturday. One exciting thing that happened recently at practice is I was able to purchase a big yellow wagon to cart our stuff from the Lied Center out the field. We can now pile up the big water jug, the cone bag, the penny bag and the soccer balls right on the wagon and wheel it out to the field. The players were very excited to use the wagon instead of hauling all the heavy stuff on their backs. It is the small things that make us happy. Can you give me another AAARRGH! We are trying to find a way to excel for 90 minutes and we are not there yet. Close enough to touch, but not there yet. We are inches away. Case in point: Central Christian College 3, CSM 1. We had 90% possession and 38 shots yet could not finish. We let CCC off the hook early by scoring but being in an offide position. The goal got called back. Moments later, CCC scored against the run of play. We fought back in the second half and got a goal back, but the thing that has been dogging us all season reared its ugly head. What is it you ask? We tend to let down when goals are scored. Happened again. Then we were fighting back and not paying attention, made 2 mistakes in a row and they finished again. What do we do? There are no instant solutions for sale at Home Depot (I know, I looked.) We just climb back in, inch by inch, step by step, degree by degree until we are there. And we will get there, we will. I believe we will rise again. OK. Here it is. CSM lost to Rogers State University, 1-4. With the score tied 0-0 at halftime, RSU put 4 on us included 2 goals in the 70th minute within seconds of each other and the last goal with 12 seconds to go in the game. We scored off of a phenomenal free kick by Kaela Croushorn. Our second half performance prompted me to prepare and give a long speech after the team had warmed down and taken off their equipment. A lot of things went through my mind about what to say. We have been talking a lot to the team about their performance and I really didn't know if more talking would have effect. But, I talked anyway. I sat down in the stands of RSU's Soldier field soccer stadium after the game and prepared my speech. I wrote down a lot of ideas. I was hoping to inspire the team to greatness. My basic message was this team has untapped strength that we need to use. I challenged the players to dig deep and find it in themselves. I even told a story about how my daugher Alex was born. We have had some moments of brillance this year, without a doubt. Our problem is that we mix in the gruesome with the great. We have peaks, but our valleys are too low and too often. Our team has all the tools they need for success--they almost don't need us coaches. They just have to step forward and take it instead of looking for someone else to sell it to them. Lately, our mentality is getting in the way. As a team, it looks like we are all just waiting for something bad to happen instead of playing to play great. I challenged the team to change the way they think and to begin believing. That is the first step. Time to rise. Next game at home versus Central Christian College at 3 PM this Wednesday, October 6th. CSM defeated the Oklahoma Wesleyan Eagles 2-1 on a goal by Melissa King. King scored off of a corner kick by Daniela Padilla with 17 seconds left in a windy game. We started off scoring in the first half with a goal by King but OWU equalized on a midfield shot about 2 minutes after we scored. The first half finished with the scored tied at 1-1. The second half was dominated by CSM. OWU barely crossed the midfield stripe yet our shots were saved, shot wide or hit the cross bar. However, CSM won a corner with about 35 seconds to go. Daniela hurried up to get the corner off in time--but she paused right before she was about to kick it. A gust of wind came up and Daniela decided to wait until it died down. It was the right decision, because when she hit the ball--it was perfect. A lofted ball drew the keeper to the near post but it was too high for her. The ball bent to mid goal over the keeper and Melissa was there to finish. The OWU keeper had a very nice half, frustrating us by constantly cutting off our dangerous crosses with her long arms and well timed saves. She just came up 17 seconds short to our delight. 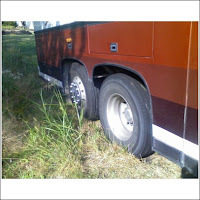 After the game-- we dicovered that after our driver returned from getting gas, he decided to back up into some shade and accidentally got the bus stuck. 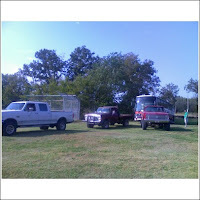 The parking lot was an uneven pasture and the driver high centered it. Deju vu all over again. 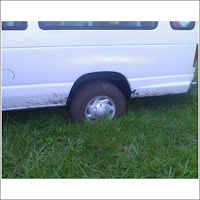 Remember a couple weeks ago--we got our van stuck on the way to a game? It happened again. 2 pickups tried to pull it out and actually snapped a tow strap. Along came another pickup and all 3 were eventually successful in getting the bus unstuck. The third pickup got there in the nick of time and our final goal also showed up at the right time to pull out a victory in Bartlesville, OK.
OK, we are in OK (Oklahoma) getting ready to meet the Oklahoma Wesleyan soccer team today at 1:00. We arrived at the sprawling metropolis of Bartlesville yesterday and ended up eating at the Oriental SUPER BUFFET! They had everything--a mongolian grill, every oriental dish ever invented and they even had crawfish, shrimp and alaskan snow crab legs. We chowed down, so to speak. Oklahoman oriental food seems to be pretty good. After dinner, back at the hotel, we commmenced our individual meetings. There is really nothing else to do--so why not? Actually, it is kind of a tradition that when we travel, the coaches meet individually with the student-athletes to see how they are doing, to comment on things they are doing well and go over areas they need to improve upon. It is also a great opportunity for the players to offer any suggestions. We didn't have a dry erase board or a chalk board to diagram formations so we ad-libbed by breaking out some change. The pennies were the opponents and the silver coins were the flames. We made a soccer ball out of kleenex and Coach Kim decorated it with her sharpie. Are we good or what? I think we started a trend. Perhaps I can sell this idea on ebay? Forget the dry erase board, the magnetic board! 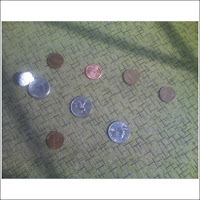 For only $19.95 you can buy our 11 pennies and 11 dimes to diagram your soccer formations. All you need is a flat surface! No more searching for dry erase markers, the whole system fits in your pocket. Act now and we will throw in a hand made soccer ball made out of kleenex for no extra charge. We are going to leave in an hour to head over to OWU. Wish us luck. Tomorrow we travel to Claremore, OK for a match with Will Rogers State. I never met a soccer team I didn't like. If only we could erase the first half of our game against Midland Lutheran. The second half, Midland scored early on a breakaway, but CSM controlled possession, had a lot of chances and scored 2 goals. Unfortunately, we gave up 3 goals in the first half to lose 2-4. In the first half, we made silly mistakes and didn't defend very well 1v1. We did a lot of ball watching and reacting instead of anticipating. Midland did an excellent job of punishing us for our mistakes. The second half we played more like ourselves and spent a majority of the half in the Midland side of the field. Hopefully we learn from our mistakes and move on. Road trip next! We leave for Oklahoma on Friday. We play Oklahoma Wesleyan at 2:00 on Saturday and play Rogers State at 1:00 on Sunday. We hop to do well! On Saturday, September 27, the Flames traveled to Pella, Iowa to take on the Dutch from Central College and came away victorius, beating the Dutch 7-1. Daniela Padilla opened the scoring in the first 5 minutes taking a pass from Kira Cross and dribbling deep in the box, beating the keeper with a rocket to the far post. Daniela added 2 more for a hattrick and Melissa King put in her 3 for another hattrick. The last 2 goals scored in the second half, one by Sara Schweiger and one by King were both from long distance and beat the keeper over her outstreched hand. It is good to see that we can score both from close range and from far away. In the second half we worked on maintaining our discipline and after a slow first few minutes, we were able to impose our will, keep possession in the opponent's half and finish strong! Before the game, some of our wacky players engaged in some shenanigans. On the way to the game, we stopped in Des Moines for an early lunch and a Subway/Kwik Stop. Kira Cross and Mollie Jones decided to try on some hats (see pic.) 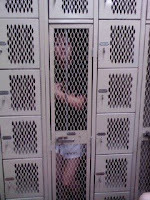 Also, Ashley Turco wondered if she could fit one of the lockers in the locker room at Central College. Well, the proof is right before your eyes...a perfect fit! Our next game is on this Wednesday, October 1 at Midland Lutheran, 4 PM. Be sure to come out and root on the Flames! After our game on Saturday, I gave the team 3 days off. We have been going strong for quite awhile and I felt like we needed rest. I also took 3 days off and didn't post anything here after the game--so I better tell you about it. 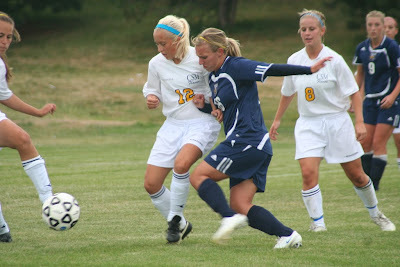 We tied MNU (Mid-America Nazarene University) 1-1 last Saturday in the final game of the NMU Tournament. We scored on a short shot by Daniela Padilla after a nice set-up by Melissa King. King was at the top of the box and played a ball across the goal. Daniela sprinted after it, all the time saying to herself, "Xlposive Edge, Xplosive Edge!" She was able to catch up to it and slot it in to break open the scoring. 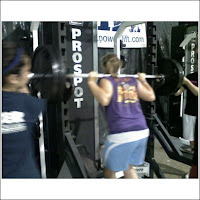 By the way, Xplosive Edge is the company we hire to do our weight training and conditioning. Unfortunately for us, MNU tied the game a couple minutes later on a corner kick. We didn't mark up very well and an MNU player had a free header that she knocked down. The ball then bounced high over our heads and went into the upper 90. The game went into overtime and we had a number of chances but nothing went in. We will work on that. Next game is Septmember 27th @ Central College in Pella, Iowa at 2:00 PM. CSM Stuck in the Mud and Mire. Baker overtakes the Flames. On Friday in Baldwin City, Missouri, the Flames lost their 3rd game of the season at the MidAmerica Nazarene Tournament. CSM fell to an excellent Baker University team 0-3. Baker controlled most of the possession and had some good chances on goal. Perhaps our poor performace can be blamed on the rain (it has been raining all day and continues to rain.) Maybe it was the fact that we left at 6 in the morning to get to the game, or perhaps it was the fact that we got one of the vans stuck on the way to the game and showed up pretty late. Whatever the reason, we played at times like our feet were stuck in the mud. I was talking to Kim (our trusty assistant coach) during the game about our struggles and she said if we counted how many players were on the field at that time that played college soccer before--the number would be 4. I do forget at times how inexperienced we are as a group. I don't want to use that as an excuse, but our lack of "speed of play" really showed up today. I usually tell people that ramping up their speed of play is the biggest adjustment new players have to make. We spent too much time reacting instead of anticipating. When we did get in a rythym, then we would make a couple silly mistakes and get scored on. The second goal that Baker scored--I think we whiffed three times in attempting to clear it. Crazy. Most of our chances came toward the end of the game when we won a few corners. We put a lot of pressure on Baker during those corner kicks, and we kept the ball alive in the box--but were unable to capitalize. If we learn the lesson that we really need to play quickly as well as play together as a team, it should really help us down the road. How did we get the van stuck? It was a series of misshaps. First, I thought we missed a turn and had to go back. OOPS, first mistake (we didn't miss the turn.) So, I pulled into a long driveway and everyone followed. I went up the driveway a bit, stopped, backed and turned to face the other direction. As I started to creep forward, one of the other vehicles pulled in at the end of the driveway, so I paused. Unwittingly, my pausing made Kim's van stop on a little incline. She had pulled the van into the grass and was turning around when I halted. 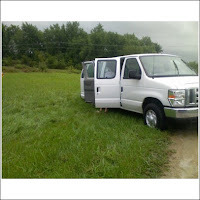 When she tried to get the van going--it just sunk it the muddy quagmire of death that was masquerading as the side of the road. The wheels of the van went round and round, round and round, round and round (you get my meaning.) The team got out to push. The pushing didn't go very well. I thought with our X-Edge training--that the players could show off their muscles and push an itty, bitty van out of the mud--but NOOOOOOO! So...we all PANICKED and ran around aimlessly, wondering what to do. Actually, what really happened is few of the players went up the the house located at the end of the long driveway, to ask for help. Thank goodness a man was home who had a chain and a big pick-up truck. That nice man hooked us up to his truck, pulled us out and we were on our way to the game. Late, but better late than never. You could say the theme of the day (or moral of the story) is "Stuck in the Mud." Stuck before the game and unfortunately during the game. We are in Kansas--and the tornado sirens just started going off as I write this. That is all we need :} Get to shelter immediately! (Actually, I checked with the desk here at our hotel and they said we are safe--the twister is way north of us. Ya--that is what probably what they told Dorothy.) Wait a minute, is that a cow flying by my window? Our team lost a close one to the Broncos from Hastings on Sunday. CSM started strong witha blast from Daniella Padilla at the top of the box with an assist from King. However, we made a couple of silly mistakes and gave up a little breakaway and a penalty kick because of a handball in the box. In the second half, Amanda Brabec scored in her second game in a row from an assist by Melissa King. Amanda scored 28 seconds into the second half. I can't really tell you more about the goal because I wa in the bathroom. My ten year old daughter told me that I need to go to the bathroom more often in games. Hastings scored an a breakaway with about 10 minutes to go. That seemed to really take the wind out of our sails and we ended up falling to the Broncos. I told my coach after the game that if we just clean up half of the errors that we made today, we will dominate our opponents. Next game is on Friday in Olate, Kansas against Baker at 10:30 am in the MidAmerica Nazarene University Tournament. We then play MNU at 2:30 on Saturday. The CSM Flames experienced their first loss of the season to the Graceland Yellowjackets from Lamoni, Iowa 1-2. We came out strong the first 15 or 20 minutes of the match, getting a lot of possession and some early chances. Katie Archibald had a shot that just barely went wide in the first 10 minutes. After the first part of the game we struggled to keep our shape and keep possession and were back on our heals for a time. Graceland was able to score their first goal on a miscommunication between defenders. We just kind of let the ball hang out in the box and a Yellowjacket swooped in, shot and scored. Graceland added to their lead a few minutes later on a corner kick. Again, we struggled coming out of the gate in the second half. The Yellowjackets had a lot of possession but not tons of chances. We were unable to find the ball. Then, on one of our few attacks, we were able to win a corner. Abbey Arlt played the ball into the box with the corner kick and Amanda Brabec climbed a ladder and got a head on it to score. An awesome corner kick and an even awesomer goal. After that, everything changed. Graceland was back on their heals and we were attacking hard and creating chances. We won another 3 or 4 corners and kept the pressure on. We played extremely hard and a lot smarter the last 15 minutes but were unable to convert. If we just took the first and last 15 minutes and look at that--we are a heckuva team. Unfortunately, in between those times--we struggled. I think if we learn from this game, be more consistant and step it up, this experience will really make us a strong team. We are currently 3-1. Thanks to all who came out and supported us! Next game is Sunday vs Hastings at home at 2:00 pm. CSM Soccer won its first tournament of the season by defeating Missouri Valley and Rockford College over the weekend in Schererville, Indiana at the Crimson Wave Invite. The invite was sponsored by Calumet College of Saint Joseph and this was the first time that we have participated in that tourney. Missouri Valley was our first game and we started kind of slow, to be honest. Mo Valley hustled a lot and put a lot of pressure on the ball. It seemed like we didn't have very much time to do anything with the ball. After about 20 minutes, Daniela Padilla played a ball into Amanda Brabec who shot and scored her first collegiate goal. Missouri Valley bounced back about 10 minutes later with a goal of their own on a long shot that caught our keeper out of postition. We responded with a nice goal by Melissa King 12 minutes later in the 42nd minute with an assist by Kira Cross. We played better the second half and created fantastic chances--2 breakaways by Melissa King and an open goal opportunity for Sara Schwieger, but were unable to convert. The game ended 2-1 and we advanced into the finals to play Rockford College. Rockford had beaten the hosts of the tourney 7-1 in their first game. They were staying at the same hotel that we were and I was able to talk briefly to the coach. Anyway, we started fast and finished strong in the final. Melissa King scored 5 minutes into the game (Schwieger with the assist) on a breakaway and that just opened the flood gates. Get ready...Daniela Padilla scored in the 22nd minute (assist by King,) and again in the 33rd minute (assist by Cardenas.) Ashley Turco scored her first collegiate goal on a nice cross by Kira Cross in the 42nd minute. Half time came and went and we just kept on scoring. Sara Schwieger scored in the 51st minute (Padilla assist,) and Daniella scored again (hatrick) 3 minutes later (McLaughlin with the assist.) Kira Cross finished the scoring with 2 long shots from the midfield (her first collegiate goals) that beat the keeper just under the crossbar (assists by Padilla and Arlt.) Final score 8-0. After the game we drove to downtown Chicago and spent time walking around, shopping, eating and talking. Coach Kim and I ran into the former AD at CSM, Kevin Lein. Kevin had just taken his son out the Cubs ballgame and was having dinner at the Navy Pier. Talk about a small world. Daniela ran into her brother and Alex saw a friend who was in the Navy. We also saw Forrest Gump. We got home safe and sound last night about 6. Leon was our bus driver and he drove good. A good trip for all. Next up--Graceland at home, 4:00 PM on Friday, September 5 and Hastings at home, 2:00 Sunday, September 7th. Hastings and Graceland play each other on our field on the 6th at 2:00 PM. Our CSM Flames beat Briar Cliff in our first game of the season, 4-1. Hoo-Rah! Goals were scored by Melissa King (2,) Daniella Padilla and Katie Archibald. All in all, it was a good outing. We got stronger as the game went on for the most part. The first half we struggled a bit against the wind and were outshot 4-12. A set of nerves plagued us a bit the first 20 minutes. For a number of our players it was their first collegiate game at this level. However, we got things straight at halftime and came out guns blazing and scored 3 goals. I was pleased that after we gave up a goal (to make the game 2-1,) we came right back and scored to make it 3-1. And then added one to put the game out of reach. Briar Cliff played extremely hard and I feel fortunate to get a few past them. It was fun to finally get out there and play after 3 weeks of pre-season. After the game when I went home I turned on the TV and the Democratic National Convention was on and Joe Biden was giving a speech. I am not much into politics but he said something that I thought applied to our quest for a great season. He said, "Failure is inevitable but giving up is unforgiveable." I think that can really relate to soccer. There are many times that we make mistakes and fail on the field. I make mistakes coaching and managing the team. It happens. What really make a difference and what defines the team in the long run is how you deal with the mistakes. Do you freak out and stop playing? Do you stop hustling? Or do you keep on keeping on no matter what? Our team needs to have persistance as one of its main values. We need to be relentless no matter what is happening and persevere. We took a step toward that tonight. There is nothing that bugs me more than people giving up on a play or in a game. At the beginning of the game--we made a lot of silly mistakes. Passing to the other team, stabbing at the ball and things like that. We were in an uncomfortable place. But we shook off that funk and were able to persevere. I like that and hope that we continue to grow in that way. I remember back in the day watching the movie, "The Outlaw Josey Wales." Chief Dan George says something in that great Clint Eastwood movie that for some reason I have always remembered: "Endeavor to Persevere." Ya, it sounds like it applys here. What do you think? Coach Ammon Bennett and his Iowa Western Reivers ventured over the river and played us in an official scrimmage with refs on Monday. CSM jumped out to an early 2-0 lead with 2 goals from Melissa King. Iowa Western was able to climb back into the game late with 2 goals--one in an extra 15 minute period at the end. Jackie Swanger saved a penalty kick toward the end of the second 30 minute period that we played. Many good things occurred. Overall, I thought the team did well. We had some fitness issues at the end of the game along with some other things, however, I could tell that we are getting used to playing with each other and improving. There are many steps still to take this season but we are progressing well. Our first real game is in a week against Briar Cliff at 5 PM on Wednesday, August 27th. We are looking forward to it. On Saturday we played a invited a group of Alumni to help us prepare for the upcoming season in the Annual Alumni Outing (see the photo of the Alumni players to the right--special thanks to Walter Fichter.) It was great fun seeing all the ex-players. IN our "large group activity," the Alumni scored first off of a poor clearance by the current CSM defense. The current CSM players came back and tied the score up and that is how we finished, 1-1. It was a beautiful day for soccer. Also--in the "discussions" with the Alumns after the game--one suggested a "team theme." What do you think about this? --> ONE TEAM, ONE DREAM! I like it, don't you? Next event: Monday, August 18th, 5 PM at the CSM practice field with Iowa Western Community College. Last night had the pleasure of meeting and practicing with the Greta Remix. They are a good team coached by Digger Hawkins that gave us a nice challenge when we played a large activity at the end of practice. We ended up scoring 3 goals on them but it was back and forth at times. They had some nice chances and our keepers happened to come up big. Gretna also did a nice job of keeping possession. I would say they had more possession than we did at and we just kinda of sat back and counter-attacked. After a water break we worked on keeping possession in their end and did a better job with that. Unfortunately, one of our freshman midfielders, Alex Aldridge, got tangled up with one of the Gretna players and fell awkwardly on her wrist ending up fracturing both her radius and ulna. She has surgery on Friday. Be sure she is in your thoughts and prayers. The doctor says she shouldn't be out too long. I was pleased with our performance for the most part. We still need work on our team shape and defense, but we did do a lot of good things and everyone was able to play. If any Gretna players read this--I thought you guys did well! Keep up the good work. If you want to post a comment...do it! Or if you want to contact me you can call or text me at 402-850-1625 or email me at jlhoman@csm.edu. Next big event: Saturday, August 16th at 3:00 with the CSM Alumni. I have been very pleased with the start of pre-season. The players are working hard and gellin'. The first day of afternoon practice was a scorcher--very hot and humid but the rest of the week wasn't bad weather-wise. Basically our schedule goes like this...we meet in the mornings at the Omaha Sports Complex at 147th and Giles here in Omaha for Xplosive Edge conditioning. We get back together at 2:30 for a meeting where we have done things like set goals, go over what I want to do for defense and distribute uniforms. Then from 4 to 6 we practice at CSM. Coach Kim Matzen and I went to a conference in Indianapolis over the weekend. Coach Michelle was in charge of the team in our absence. Instead of practice on Saturday, the team went bowling. I am sorry I missed that because, as the team knows, I use my powers of sports psychology to excel at the sport of bowling. I hear that Jackie and Melissa made quite an impact at the lanes and were the leaders of the winning team. What did they win???? Kim promised to take them out for ice cream. A good time was had by all. Moving on to a more serious note..one great thing that we have been able to do this year is finish our practices with a big game going 10 v 10. It has been a great opportunity for me to be able to watch players and start making decisions about who is going to start, etc. Actually, my "starting philosophy" is kinda weird. I try not to put a whole lot of emphasis on "starters" and "non-starters." I do see benefit in identifying the top 12 to 14 or so players, ya. However, just because you begin the game on the field when the whistle blows, doesn't mean in my mind that you are necessarily one of the top 11. I may save a good player for later for tactical reasons. Here's the deal...it doesn't make sense to me to put the "strongest" players on the field at the beginning and then sub them out with "weaker" players so you get weaker as the game goes on. I want a balance. Also, I put parenthesis around the words "stronger" and "weaker" because some players are strong in some areas and weak in others. For example, an opponent may prefer to send long air balls at our defense and run on to the ball. I need players in the back who can head the ball. My best header may not be the quickest player on the field or the most skilled but she needs to be in the game if the other team boots it high all the time. One of the strengths of our current team is its diversity. I think there are players who will have specific strengths that we can take advantage of when the time is right. It should be awesome to see. Alex's signing brings our total active roster to 20. Coach Kim Matzen (our wonderful assistant coach--recently married to David Matzen)can't remember ever having 20 players on the roster. Coach Kim helped start the soccer program as the starting keeper in 1994 and after she graduated--she became one of the assistant coaches and has been with the program since then, so she should know. The coaching staff can't wait to get this great recruiting class on the field. August 4th can't come soon enough for us! In the meantime, We won the championship of the adult women's 8 v 8 league on penalty kicks. Kaela Croushorn scored the winning PK to give us the championship for the second year in a row! We are also finishing up our summertime training at X-Edge. It has gone very well--we recently had a freshman set a school record with a squat of 225 (two 45 pound plates on each side!) We also just finished up putting on a camp for the Springfield Soccer Club this past week. It was hot but it was a lot of fun. Some the highlights were watching camper Alexis winning the limbo contest and in the campers vs coaches final game--the campers tied the coaches 2-2! Today my family went to Molly McGowan's wedding to Andy Cada in Schuyler. It was a very nice wedding and a fun reception. I saw a number of former CSM players at the wedding and reception. It is great to see teammates supporting each other. It has been a summer of CSM weddings. Our assistant coach Kim Ernesti ('98 CSM grad) was married in May to David Matzen. Mandy Saar (09,) who played for us last year was married a few weeks ago. Molly ('08 grad) walked the aisle today and Jessi Brannen ('08) gets married on the 19th of July. 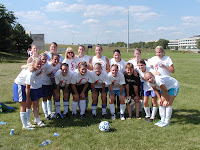 As a matter of fact, both Molly and Jessi got engaged during the 2007 soccer season. It is truly great to see these quality individuals get married. You hope that CSM has been an important part of their lives and will continue to be so. Pre-season begins in a few weeks on the 4th of August. We are all looking forward to getting started. In the meantime, we are playing in the Sunday 8v8 league (record= 2-1) and will be in Springfield July 21-25 putting on a soccer camp to help the club players there improve their soccer skills. I would like to introduce the newest member of the CSM soccer team, Carissa Orborny. Carissa graduated from Schuyler Central High School this year and was the teammate of Amanda Brabec who signed with us in May. Carissa plays midfield and defense and is a very quick player. She signed today during her school orientation. Welcome Carissa! 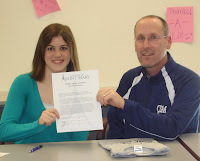 With Carissa joining the team, that makes the largest CSM soccer team in 5 years with 19 players. The current players are Daniela Padilla, Melissa King, Jessie McLaughlin, Claudia Cardenas, Tiffany Reis, Nikki Prusha, Kira Cross, Amanda Brabec, Carissa Orborny, Mollie Jones, Abbey Arlt, Jackie Swanger, Kaela Croushorn, Katie Archibald, Courtney Pearcy, Hillary Brown, Erin Peterson, Sara Schwieger and Jessica Alexander. I was flipping through channels tonight on TV and I came across the movie "Glory Road." It is the story of the Texas Western basketball team who in 1966 thrilled portions of the nation by winning the NCAA Men's Basketball Championship with an all-black starting lineup, thus breaking an unspoken barrier and transforming the history of college basketball. The team had to face all kinds of adversity that year, especially from those who were racist. The team responded to the adversity by becoming closer, by encouraging each other and inspiring each other to overcome everything and play to play great. It wasn't an easy road. It was very difficult for the whole team. But I was inspired by the movie--it shows that a team, if they stay close to each other and support each other through adversity, great things can happen. I would recommend the movie if you haven't seen it. It is awesome. Wow, don't you just love the weather! Today, I gotta say, thank God for the beautiful day. I just spent a weekend in Kansas City going to soccer games where the wind chill was in the teens. Yikes. Currently, I am coaching high school soccer as well as trying to get to some of our recruit's games but it ain't working out so well. Coaching a high school team (Gross Catholic Girls) keeps me way busy. That and the horrible weather has prevented me from getting out there. A number of the games I could have gone to (so I could say "Hi!" to our recruits) have been cancelled due rain, cold or even snow. Hopefully today is the start of a warming trend that lasts until the summer. We shall see. Oh, and another thing, could anyone do something abou the wind? 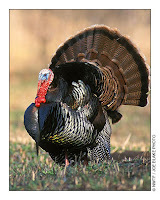 I don't need 45 mile an hour wind gusts and it seems like that is about all we have had around here for months. 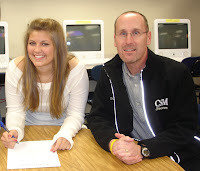 On last Thursday the 20th of March, Kaela Croushhorn signed her letter of intent to play soccer at CSM in the fall. She is lucky number 13--the thirteenth recruit to sign this year. Kaela went to high school at Lewis Central in Council Bluffs and attended CSM her freshman year and played soccer at that time. She decided to transfer to Hannibal-La Grange in Missouri for her sophomore year. She emailed me a few weeks ago and said she would like to come back to CSM! I thought it was a good idea since she had a great freshman year and a few weeks later, Kaela signed again for us. Kaela told me that she is going to pursue a Bachelor's in nursing at CSM. We are pleased to have Kaela back with the CSM family. 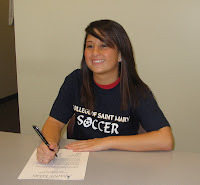 Millard South Soccer Player Signs her Letter of Intent! 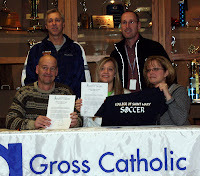 Jackie Swanger, goalkeeper for Azzurri Mistral and Millard South, signed her letter of intent on Tuesday, March 11. I met Jackie and her parents in the Millard South conference room for the event. One of the assistant principals from Millard South was also there along with Jackie's high school coach, Kim Harrill. It was a beautiful day (for a change) and the sun was shining in the windows. A perfect setting for signing your life away (ha, ha--joke.) Jackie is a very good student and is going to study in the pre-vet program. Jackie actually practiced with the CSM soccer team a couple times in the fall. Our assistant coach, Kim Ernesti, has been Jackie's private keeper coach for a number of years and Coach Kim thought it would be good for her training to have some live shooting. It is also kind of a funny coincidence that our other keeper recruit (Mollie Jones from Columbus Scotus) is also going to study in the CSM pre-vet program. They will have much to discuss as Kim trains them. We can't wait for Jackie (and everyone else) to start! Yesterday the team began playing in the spring indoor college women's league at the Omaha Sports Complex. We will play for about 6 weeks. It is a great opportunity to work on some soccer skills and play against good competition. Our game was against Bellevue University alumnus and we lost 1-2. We generated a lot more opportunities than our opponent, but could not hit the goal. We did not keep official stats for the game (we are playing "just for fun") but we had a large number of shots hit posts and crossbars and go just wide--I would guess that we outshot them by 10. Sometimes that is the way it goes--soccer can be a cruel sport. The next game is March 16 at 8:00 against Bellevue University. The other teams in the league are Wayne State, UNO, Dana and Midland Lutheran. Ashley Turco signed her letter of intent at Millard South on Wednesday, February 27. Ashley's dad and grandmother were also there for the big event. Ashley is a senior forward at Millard South and is looking forward to a great high school soccer season (if this weather will ever treat us right.) I am happy that Ashley will be joining us next year at the College of Saint Mary. She will certainly help us out. Ashley played her club soccer most recently with Phoeniz Infierno and has played with fellow CSM recruits KaSie Bergland and Kira Cross. Right now, we are in the 4th week of our winter conditioning program with the Xplosive Edge. X-Edge is located inside the Omaha Sports Complex, also known as "The Center" on 147th and Giles, just off of the highway 50 exit on interstate 80. We are trained by Gibb Duvall and Jaron Cook. I really believe in the benefits of their program. One way the X-Edge training shows itself is in the latter part of games. For example, last season the team went into 3 overtimes and won all three. Part of our success in overtime I attribute to our X-Edge training. Another big reason I believe in the X-Edge program is because of injury prevention. We just do not get soft tissue injuries (muscle pulls.) The only injuries we have had the past two seasons are a couple ankle sprains due to bad turf and a clavicle break (she got her foot caught in a net and fell hard on her shoulder.) Also, their program teaches correct running and cutting techniques which helps prevent injuries like ACL tears. It is challenging and not many people like getting up early to go work out, but I think it is great. It is part of who we are. I would recommend the X-Edge program to anyone. Another Soccer Player Signs with CSM! 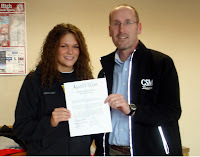 Nikki Prusha signed her letter of intent to play for CSM in the fall this past Monday (February 25th.) Nikki is very excited to be able to join the team. She wants to be a nurse and was very impressed with the CSM nursing program. Nikki is a current freshman in college and is taking classes at Metro this semester after her first semester at UNO. Prusha played high school soccer at Gross Catholic (2007 grad)and club soccer for Azzuri Valencia, the same team that one of our other transfer students (Schweiger) played for. I am delighted to sign Nikki and I look forward to coaching her again. Erin Peterson, a senior defender from Ralston High School, put pen to paper on Monday, February 11, signing her letter of intent for CSM. 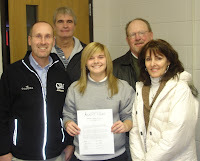 Erin's mom and dad and high school coach, Andy Parizek were there to see her sign. Erin was also interviewed by the Ralston Recorder. We are very happy to have Erin as part of the flames family. She is a very smart and powerful player who reads the game well. Erin wants to go into education at CSM. I am sure she will make a fine teacher as well as an exemplary college soccer player. Erin is the 9th player to sign for CSM this year. On Thursday, February 7th, I got into my car and drove to Columbus so I could hand-deliver a letter of intent to Abbey Arlt so she could sign with CSM. Abbey is a current senior at Columbus High School. The signing ceremony occurred in the CHS library. Abbey's parents and coaches were there to witness. Abbey is a wonderful player with a great family. I think she will make a fantastic contribution to the team and I am looking forward to coaching her. At this time, Abbey has not decided what she will major in at CSM. Welcome to the CSM family, Abbey! See what the Columbus Telegram has to say about Abbey! Katie Archibald, Iowa Western Community College midfielder, signed her letter of intent with us on Wednesday, February 6th. Katie is the teammate of Courtney Pearcy, who signed with CSM in December. As you recall, Iowa Western is the junior college National Champion runner-up in 2006 and 2007. I am very pleased to add Katie to our the recruiting class of 2008. She will add her athleticism, work rate and great personality to the team. Katie plans on majoring in business with an emphasis in accounting. Welcome to the team, Archie! On Tuesday, February the 5th, Kira Cross signs her letter of intent with CSM. Kira is a soccer and a basketball player who is looking forward to competing at the college level. Kira is a current student at Gross Catholic High School in Omaha where I also coach. I think Kira will enjoy her experience at CSM and I am looking forward to continue to coach her. Kevin Lien (our basketball coach and AD) is also excited about Kira joining the basketball team next year. It will be just great! 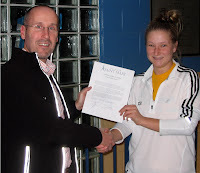 Mollie Jones, current starting goalkeeper at Columbus Scotus, signed her letter of intent with CSM on Tuesday. Mollie is also a softball player and will be playing for CSM on the softball team as well. Softball Coach Chuck Brewer and I drove to Columbus to witness the event. Mollie's coaches were there along with her parents and the local newspaper reporter. We are excited to have Mollie as a part of the team. CSM has a great tradition of awesome goalkeeping. 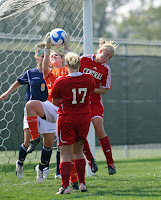 Last year's starting goalkeeper, senior Laura Forbes was the MCAC Defensive Player of the Year. We hope that Mollie continues that tradition (or course, with help from our stellar Assistant Coach Kim Ernesti, who is a former All-Region goalkeeper with CSM.) Mollie is quick and agile and is great under pressure. I just can't wait for next season to begin! Read what the Columbus Telegram has to say about Mollie. Sara Schwieger is the latest player to be joining the great soccer tradition at CSM. Sara is a current freshman who played for Wayne State in the fall of 2007. She will transfer to CSM in August and will be studying occupational therapy. Sara is a 2007 graduate of Millard West High School here in Omaha. As you may recall, Millard West's girls soccer team won the 2007 State Championship. Sara played her club ball with Azzurri Valencia coached by Paul Elam. Sara is an awesome defender and a strong player and we can't wait to have her play for us! OK, I just received this picture and I had to post it. It is my 10 year old daughter's club team. I helped coach them to a championship last week. 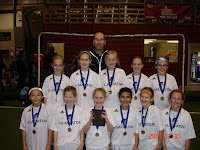 They were in the "Winter Blast" soccer tournament and won first place with an undefeated record. They got through group play without a blemish but had to go to a shootout in the semi-finals against a team from West Des Moines. Our team won the championship game 2-0. It was a great group effort. The team played well. Could there be future CSM Flames on the roster? We sure do hope so! My daughter (Alex) is the one holding the championship plaque in the photo and she tells me she is going to CSM! She is quick, determined, and really understands defense. She was always very dependable, worked hard at practices and in games. She is definitely a good candidate for your program. I would strongly recommend her to you. We really look forward to having Hillary as a part of our awesome soccer program.